Making sense of our universe...It's an age-old practice that transcends cultures and generations. From our vantage point, the larger than life Maya civilization grappled with the urge in a grand scale. Join us as we take a voyage to understand the ways of the Maya. We'll learn what they held as sacred, how the sacred manifested itself in their lives, and about efforts to accurately portray them, despite romanticized versions. 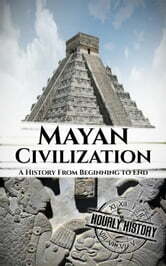 This eBook provides a deeper look at their pre-Columbian battling dynasties and their highly-structured approach to religion, science and society, as we explore their glories and misfortunes.